There were plenty of moments, plays and statistics that could sum up North Carolina’s 113-96 demolition of N.C. State (16-7, 4-6 ACC) at the Smith Center on Tuesday night. It could have been that No.8 UNC’s offensive explosion set a new record for points scored in the 236th game of the rivalry series. Maybe it was Luke Maye (the “Wolfpack Killer”) dropping 31 points alongside 12 rebounds. Or perhaps you could point at the play where Coby White coolly drained a three after Kenny Williams nearly jumped into the stands to save an offensive rebound and find White wide open. Because that’s what the Tar Heels (18-4, 8-1 ACC) did on Tuesday. They took care of business. It was flashy at times and frantic at others, but for the sixth straight game following its historically bad 83-62 loss to Louisville, UNC did its job and it did it well. Johnson opened the scoring for the offense with a corner three just 12 seconds into the game and his teammates quickly followed his example. His 17 points only tied him with Kenny Williams for the team’s third-most, trailing Maye’s 31 and White’s 21. 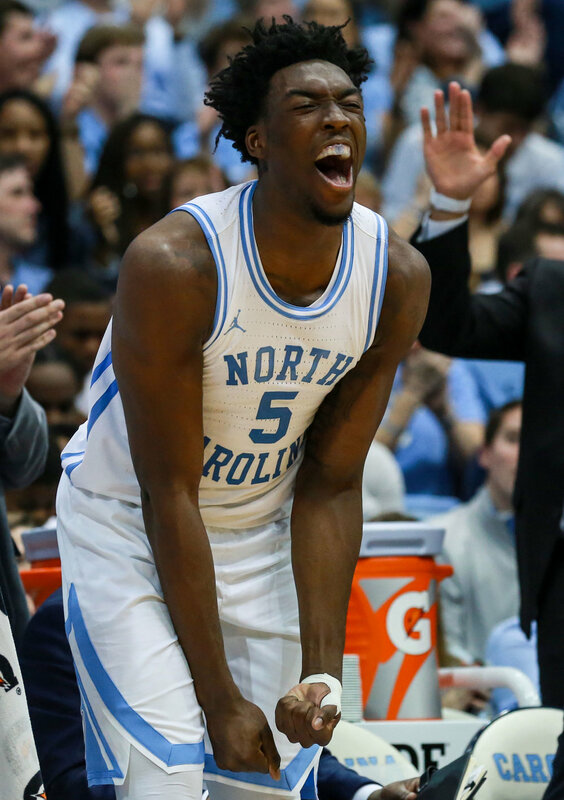 Nassir Little also joined those four in double digits with 12 points thanks largely to 8-10 free throw shooting, while Garrison Brooks had another solid game inside bringing down 10 rebounds and dishing a career-high six assists. Save for Maye having his third career 30-point outing against the Wolfpack, little from Tuesday’s game will reverberate through the national college basketball landscape. The focus instead likely stays eight miles down the road, where No.2 Duke used an explosive second half to cruise past Boston College. ESPN’s College Gameday will be on hand Saturday to see the Blue Devils take on No.3 Virginia with coverage centering on how that game’s winner can hand the loser a second conference loss and take control of the ACC race. But there’s a third team in the nation’s best league with just one conference defeat: UNC sits at 8-1, tied with Duke and Virginia atop the league standings. In the 24 days that have followed that disastrous Louisville loss, the Tar Heels have shown time and again that the team that rolled over against the Cardinals is not who they really are. Who the Tar Heels really are is a team that can outscore and outrun you en route to 100+ scoring nights (as they did Tuesday as well as against No.11 Virginia Tech), but still a team that can win ugly and lock down on defense, holding Notre Dame and No.16 Louisville under 70 points and Georgia Tech under 60. They can win on the road or they can win at home. The Tar Heels started the season 0-3 in games that followed wins against ranked opponents, losing by an average of 15.3 points over those three defeats. In their current six-game win streak, they’ve followed both ranked wins (No. 11 Virginia Tech and No. 16 Louisville) with resounding double-digit victories. Senior guard Kenny Williams said he’s seen a different intensity lately, highlighting his team’s improved pre-game approach since falling flat at home against the Cardinals in mid-January. White is a freshman who’s played only 21 games, but he said the team has come together “as a family” in the past few weeks. UNC will put its streak back on the line Saturday against Miami, followed quickly with its first test against one of the ACC’s best when it hosts Virginia on Monday evening. This run won’t continue all the way into the postseason, five of UNC’s final nine conference games come against the ACC’s top half — highlighted by that UVA showdown and two match-ups with Zion Williamson and Duke. The ACC’s elite are coming. Soon they’ll find out they’ve got company.